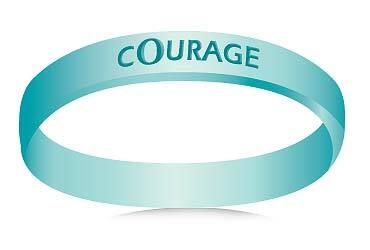 The teal wrist band represents the cOurage to cope with an ovarian cancer diagnosis, the cOurage to fight to find a cure, and the cOurage to spread the message about preventable measures that women can take against ovarian cancer. About 25% of ovarian cancers are found at an early stage. Early detection improves the chances that ovarian cancer can be treated successfully. Unfortunately there is no reliably effective test for finding ovarian cancer early. We lose more than 16,000 mothers, sisters, and friends to the disease each year. But if treated early, 9 out of 10 women will live longer than 5 years after an ovarian cancer diagnosis. For more information about ovarian cancer and to view the American Cancer Society's prevention and early detection guidelines, please visit www.cancer.org.